When the Runner encounters Troll, trace – if successful, the Runner must lose click or end the run. You gotta pay the troll toll to get in. Ice without subroutines is weird. It just is. A runner is going to hit this and realize that their breakers cannot help them. The corp does not boost the strength of the trace, and the runner pays their way through. If the runner doesn't have any link, this is a pretty effective tax; 2 credits per run adds up fast. This makes Troll about the same as a Pup. However, against any runner with link (Kate and Andy, most often) this drops down to only a 1 credit tax, which is not useful, and if someone is doing the Underworld Contact it's essentially worthless. The corp decides to boost the strength of the trace by X, and the runner pays through the increased cost. Basically the same as above, but forcing an additional one-for-one credit spend. Whether or not this is a good idea depends on which side has the better economy in the matchup, and even then only if you are convinced the runner will pay in. The corp does not boost the strength of the trace, and the runner takes the click option. Different runners account for time differently. Against a Mopus economy, a click lost is worse than 2 credits spent, but against a drip economy deck with Data Folding or Underworld Contact then their clicks are not nearly as useful. The corp boosts the strength of the trace by X, and the runner takes the click loss. This is usually a bad outcome for the corp. Losing a click to dodge a higher tax is almost always worth it, and it's always comforting to watch the corp waste money. The corp does not boost the strength of the trace, and the runner ends the run. Another good option, albeit an unlikely one. Getting a run ended means the runner loses the click they spent to initiate the run, and any credits they had already committed. Usually, the runner is going to either pay their way through or take the click, but if they are flat broke and on their last click maybe they don't have a choice. But if that's the case, then the corp has probably already won. The corp boosts the strength of the trace by X, and the runner ends the run. Again, the runner will typically take the click loss rather than pay the higher cost, but if they are on their last click they might decide to abandon the run rather than pay the higher cost. The value of this trade depends largely on how valuable the thing you're protecting is. 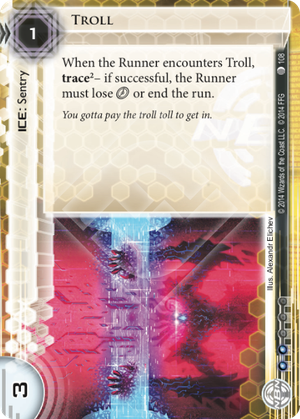 If the runner has link, don't play this card. Pitch it into Archives and forget about it. If the runner is running last click, and your economy is better than theirs, and there's something valuable behind it (or, you want to bluff that there is) then feel free to spend a credit or two. Good synergies with this card: Bioroid Ice makes it more likely that they are out of clicks when they hit Troll, and increases the value of a click to the runner. Heinlein Grid makes the click loss even worse. NBN: Making News can boost the strength for cheap, but compared to other tracers this isn't so useful. It's always fun when they lose a click and hit a Snare! and then don't have time to draw up to dodge the kill next turn. And, of course, Spinal Modem hates this card. When i saw this ice i thought "ahah, funny". Now i think it is AWESOME. Lose a click OR etr. Unbreakable. With a trace 2. On HQ makes u less hittable from siphons, on r&d tax, on remotes taxs and makes a funny combo with Heinlein Grid. I tried it in 2 total different decks(an HB with heinlein and, actually , a NBN: Making News so damn strong) and both times it has a central role. But i thought was just a funny to play ice. Not one of the strongest i've never use. Don't believe me? Try it. Yeah, another cheap ice with encounter ability. Nice. But this card can do way more than just taxing. First. Runner must suffer click loss (etr is another click loss, right?) if you have enough money! This is different from Enigma. you can't ignore this by running with your last click. Bioroids, Heinlein Grid, (and maybe Strongbox) likes this. AAnnnd, put this in your RP remote server. troll+caprice on remote is very fun combo. As SlayerCNV said, can be semi-siphon defense in HQ. And very good with NBN: Making News, ChiLo City Grid, and maybe Spinal Modem?!?! he. This present an interesting logic problem: can Troll get trashed by Forked? Let's recap. The text of Forked says: "The first time you break all subroutines on a sentry during this run, trash that sentry." Intuitively one would say you break all subroutines that exist, which are none so Troll instantly dies to Forked. Another interpretation is that you don't break all subroutines. You've broken no subroutines. Another interesting conundrum: can Inversificator swap Troll?